Tungsten alloy nail we provide is base on the high density and high melting point, which usual used on the military and other areas. Perfect for adding a small amount of weight to your soft plastic baits, they are composed of 95% tungsten, 3.5% nickel and 1.5% iron. Much denser than lead, tungsten alloy allows the nail to be even more compact relative to their weight. This inhibits the actions of your soft baits even less, and allows them to perform at their peak potential. Available in multiple sizes, they are also environmentally friendly to help protect our fisheries. Tungsten alloy, also named tungsten heavy alloy generally is refractory metal, which have two-phase composites consisting of W-Ni- Fe or W-Ni- Cu or even W-Ni-Cu-Fe, some tungsten alloys are added Co, Mo, Cr and more. They have very high melting point and have a density twice that of steel and are more than 50% heavier than lead. 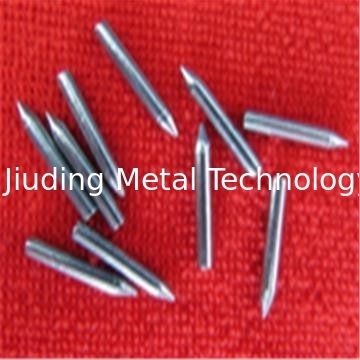 Tungsten alloy nail are one of the best buys in tungsten on the market. Designed to be inserted in to soft plastics, these babies slide in easy and stay in thanks to the ribbed bodies. Use these when wacky rigging to get your baits down deeper and throw a different action in to the mix. They are also very useful to have on hand for aligning swim baits that are swimming off to the side.